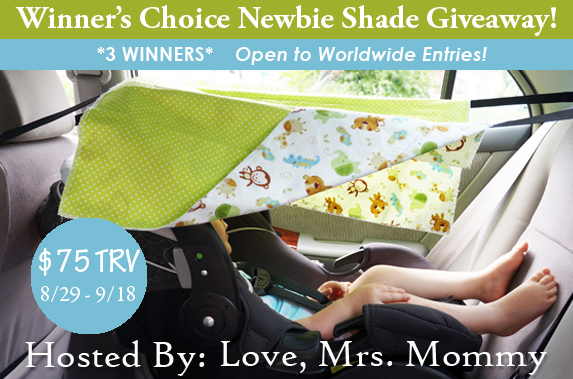 Love, Mrs. Mommy: Winner's Choice Newbie Shade Giveaway! 3 Winners! This is a wonderful giveaway for our little travelers! 3 Winners will receive their choice in shade and it's open to worldwide entries! :) Good luck! Newbie Shade is a family-owned and operated company that came into existence due to their desire to shade their new little baby girl from the bright California sun. After trying countless other products with no success, they designed the Newbie Shade! This shade is fully compatible with infant, convertible, and all-in-one car seats. It provides full shade coverage, while still allowing for the use of a backseat mirror attached to the center seat. Shading your child, while still being able to see them is wonderful! Disclosure: Love, Mrs. Mommy and all participating bloggers are not held responsible for sponsors who do not fulfill their prize obligations. Love, Mrs. Mommy received a Newbie Shade at no cost to facilitate the above-mentioned review. This giveaway is in no way endorsed or sponsored by Facebook or any other social media site. The winners will be randomly drawn by Giveaway Tools and will be notified by email. Winners have 48 hours to reply before a replacement winner will be drawn. If you would like to participate in an event like this please contact LoveMrsMommy (at) gmail (dot) com.